Neighbourlytics draws data from a range of publicly available sources, including social media platforms, rating and review websites, travel wikis, event promotion pages, and other dynamic digital sources. This is what’s often referred to as “big data” – the detailed information about human behaviour that is increasingly being recorded as we use digital technology for more and more of our daily tasks. How granular does the data get? Can you track what individual people are doing and saying? No. We take privacy seriously. While other social media monitoring tools track the activities of individuals to create consumer personas and behavioural predictions, we are looking to these digital sources to uncover how people interact with and value the places they go. Like the Census, our data is de-identified and focuses on group trends rather than the behaviour of individual people. What kind of insights can Neighbourlytics provide me with? Places: What does the neighbourhood have to offer, what's popular and why, and how is it changing? Activity: When is the neighbourhood busy, what generates activity, and what local events and activities are typical? Stories: What do local people talk about, are they proud of their neighbourhood, and what local places do they talk about and promote? Crucially, Neighbourlytics allows you to compare neighbourhoods to one another – meaning you can instantly compare your project to another location, anywhere around the world. It also operates in real time, so you can see how neighbourhood activity changes from hour to hour, from year to year, or anywhere in between. For a clearer picture of the insights Neighbourlytics provides, check out our sample reports. How long does it take to collect my data? Our process is automated, meaning our data collection machines start turning as soon as you submit your request. Our standard reports require 4 days of data collection, and are released every Tuesday. This means if you order by Thursday, you will have your report within 4 days. Pricing ranges from $900 for a single report to $7000 for yearly access. We can also tailor a package specifically for your needs. Find out more about our products and pricing. How do I purchase a Neighbourhood Snapshot report? Select your project location. This can be a suburb, postcode or an actual address. Your interactive report will be ready and waiting in your online portal within 10 days. Contact us if you’re interested in Neighbourhood Tracking or a Regional or City-wide Snapshot. I’d like to include Neighbourlytics in a tender I’m working on. We’d love to help! Once you sign up, you can download all the information you need to include in your proposal via your online portal. Other population data sources provide information at a postcode or municipal level, which can gloss over truly localised insights. Neighbourlytics collects data from within 1km of your focus site, giving you the nuanced understanding necessary to deliver a project with real social value. We also understand that resident population analysis misses out on a wealth of information about the people who work in, travel through, or visit a neighbourhood. With more and more of the actions we take online recording our location, Neighbourlytics harnesses geotagged data to analyse both visiting and resident populations. Lastly, Neighbourlytics is about more than just numbers. 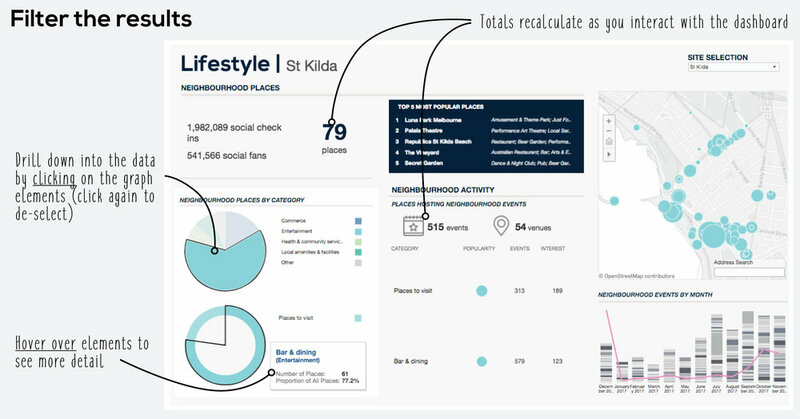 We mine social media to find out about a neighbourhood’s character, and the aesthetic and lifestyle preferences of the people who spend time there. How is Neighbourlytics different from other population data sources? Neighbourlytics differs from other social media analytics services in two ways. Firstly, it’s been developed especially for citymakers, by citymakers. We understand what kind of information you need to make smart and successful urban development decisions, and have designed Neighbourlytics with you in mind. Secondly, unlike analytics services which are primarily designed to report on social media users’ opinions, Neighbourlytics combines sentiment analysis with detailed data on the way people move through and use physical places. How is Neighbourlytics different from other social media analytics services? No. The data is adjusted for younger people’s more active use of social media. Read more about Australia's social media use. Will the data that comes from social media be skewed towards younger people? Why is social data important? Think of a place that you love to spend time. It might be your local main street, the neighbourhood where you grew up, or a favourite holiday spot. These places we love and feel connected to have distinctive personalities, they’re memorable. We know that the best local places are vibrant and complex, they are authentic, and offer unique experiences. But the challenge facing city-makers is how to measure the ‘urban life’ we are seeking to create. How can we quantify the nuances of local identity, and how do we know if our plans and strategies are getting it right? Traditional data sets are often not enough. The census only tells the story of residents, and is outdated before it’s even released. Consumer research focuses on generalisations rather than diversity. And community engagement processes can struggle to reach enough people to uncover the nuances of what’s unique and special about a local place. Unlike postcode level statistics, this data is nuanced and hyperlocalised, making it highly valuable to urban planning, and understanding the evolution of places over time. Neighbourlytics is the brainchild of two urban development professionals with thirty years of combined experience working in Australia and overseas. They are supported by a team with expertise spanning data science, Smart Cities technology and product development. Find out more here.